This is a large underground karst cave of 2500 square meters with rich decoration of stalactites. It consists of two branches which are linked by a long up-sloping corridor and a very low passage. Each section comprises a large central room surrounded by smaller areas. Those of the E. section are subdivided in parts by drystone walls. The entrance is a hole in the roof of the cave, through which there is a drop of 8 m. into the first room. In the 19th century it served as the safest refuge of the chief of the robbers Davelis. Before World War II there were plans to convert it into an "entertainment center". Later on plans to make of it a place worth of visit were annulled due to dense construction in the surrounding area and to destruction of its stalactites and stalagmites by the draining system. 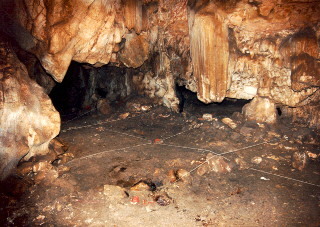 During its investigation by ESE in the sixties it was revealed that the cave had served as a habitation site in the Late Neolithic Period and the beginnings of the Bronze Age. The archaeological investigation started in 1994 under the direction of Dr. Margarita Koumouzelis. Besides the collection of the rich surface material, the excavation in the area by the entrance brought to light layers of fire, stone and bone tools and ceramic vases and sherds of the Late Neolithic Period. This is the only cave in the city of Athens with neolithic habitation.